A car dealer may have several examples of the same model with different equipment packages on the showroom floor for buyers to compare, but most yacht dealers are unable to stock even a single million-dollar yacht. Thus, the only yacht a buyer can actually see is privately owned and usually has been customized to the tastes and needs of the owner. Therein lies a quandary faced by both potential buyers and yacht builders. Because not all owners have, ahem, good taste, that yacht may reflect badly on the builder-it&apos;s not always easy to see past an owner&apos;s appalling preference for purple. Yacht builders (and dealers) live or die by the good or bad taste of owners. 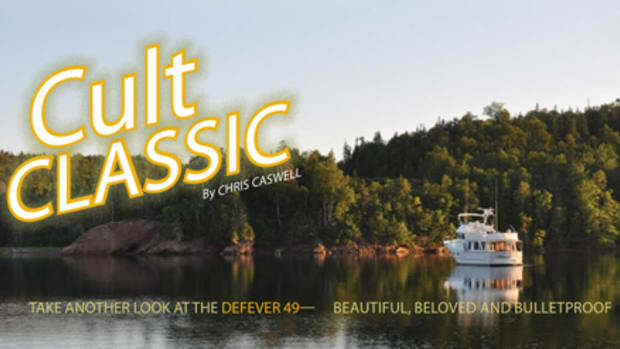 In the case of the Ocean Alexander 60 Trawler, however, we were able to board and compare two factory versions that are as dissimilar as night and day. And behind that is a story which begs telling. When some builders claim to offer "semi-custom" yachts, what they really mean is they offer a choice of teak or mahogany interiors, granite or Corian counters, and perhaps the option of a larger engine. Obviously, that results in yachts that are essentially identical and won&apos;t slow down production-line efficiency, but they look somewhat different. Ocean Alexander takes a different tack by preplanning a variety of options that allow owners to truly customize their yacht. In the case of the 60 Trawler, there are so many combinations available, it&apos;s unlikely there will ever be two identical boats. If you don&apos;t think that&apos;s possible, take a look at the OA 60 order form. When it comes to layout alone, the choices include two arrangements for the saloon, pilothouse, galley, and cockpit, and three for the master stateroom. 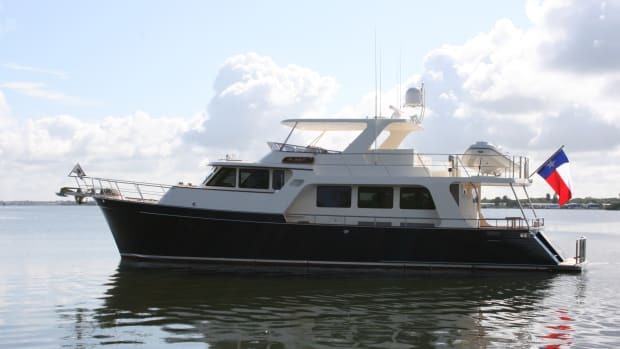 You can also tailor the 60 Trawler to have two, three, or four cabins. Mix and match, as they say. Then there&apos;s the power: the 60 Trawler comes standard with a pair of 455hp Caterpillar C7 ACERT diesels, but the option of a single 575hp Cat C9 ACERT is offered. Twin-engine proponents are happy, and single-engine buyers are equally satisfied. Win-win. 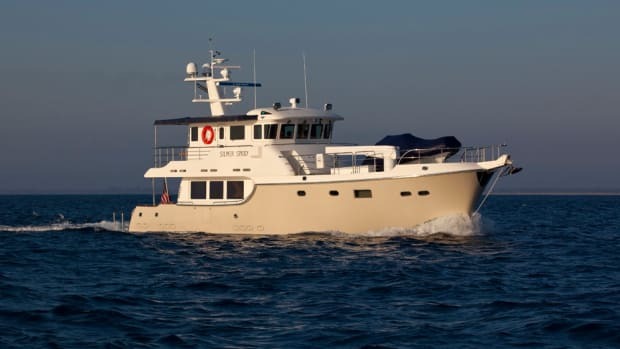 The two Ocean Alexander 60s that I reviewed were at each end of the spectrum: a two-cabin, twin-engine trawler with hydraulic stabilizers (detailed in the sidebar on page 57) and a three-cabin, single-engine 60 with a Seakeeper Gyro stabilizer. In many ways, Ocean Alexander has gone back to its roots with what it calls the 60 Trawler Extended Cruiser. 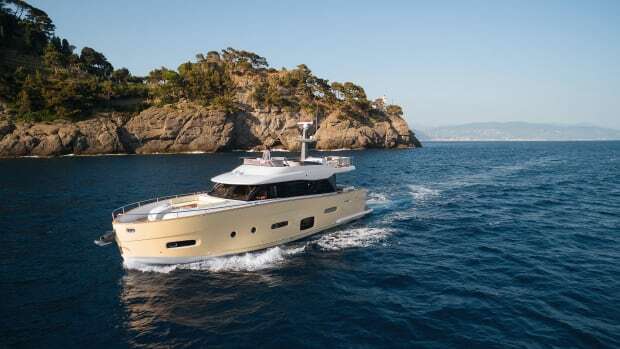 She is certainly designed for extended cruising, but the name also applies to the hull, which is a stretched version of OA&apos;s well-proven and seakindly 54 Trawler. Ed Monk Jr., who has been associated with Ocean Alexander since Alexander Chueh took over the company to settle a business debt in the 1970s, penned both hulls. Monk&apos;s first design for Ocean Alexander was a sturdy trawler; nearly four decades later, the company (now led by Alex&apos;s son, John) is returning to an offshore cruiser. Between us, I like the stretch version best: at 60 feet, the yacht has the right proportions and a pleasant sweep to her sheer. Although her flared bow has a commercial heritage and the Portuguese bridge has the look of a tough offshore fishing vessel, both conceal thoroughly modern touches. Invisible below the waterline at the bow is the Ocean Alexander "S-bow," a proprietary design that draws on the bulbous bow used by ships to reduce the stern wave. But rather than a typical bulb, the OA engineers narrowed it to reduce pitching, spray, and pounding. From abeam, the Portuguese bridge looks like others, but up close, you&apos;ll see it&apos;s a pleasant sitting and dining area with an optional table between two padded settees. It would be the perfect place to lounge when riding at anchor in a pleasant lagoon, enjoying the trades and sipping on something with an umbrella in it. One area that benefits from the hull stretch is the aft deck, although some of the footage has been given to the saloon. I like the aft deck because, rather than cluttering it with built-in seating, Ocean Alexander left it open so an owner can add loose chairs as needed. Surrounded by extra-high coamings and fully shaded by the boat deck, it has boarding doors on each side and a single transom door to the swim platform. If you choose the layout with crew quarters in the lazarette, a settee is added to the cockpit to provide headroom in the cabin below. Many builders narrow the side decks to provide as much space as possible in the saloon, but Ocean Alexander resisted that temptation. The result is comfortably wide decks that allow easy and secure movement fore and aft. It&apos;s an important feature if you&apos;re shorthanded and need fast access to lines and fenders, and the decks are also protected from sun and rain by the bridge overhang. Inside the saloon, the missing few inches that make such a difference on the side decks aren&apos;t noticeable, and large windows allow good visibility even when seated at the L-shaped settee or in the two loose chairs. Entry is through a Diamond/Sea-Glaze Dutch door with dogging latches, and the saloon has a sensible teak-and-holly sole that won&apos;t mind wet shoes. Much of the interior is afromosia, a rare wood also called African teak that is very similar in color and grain to its namesake. The galley, just forward, is fitted to satisfy a gourmet, with a Gaggenau propane four-burner cooktop and oven, plus a Jenn-Air microwave. A full-size Sub-Zero refrigerator with two freezer drawers faces forward so it won&apos;t open under way, and it is concealed behind a burled fascia. The cook also is treated to a large window on the world, more than ample stowage in drawers and lockers, and additional counter space opposite. 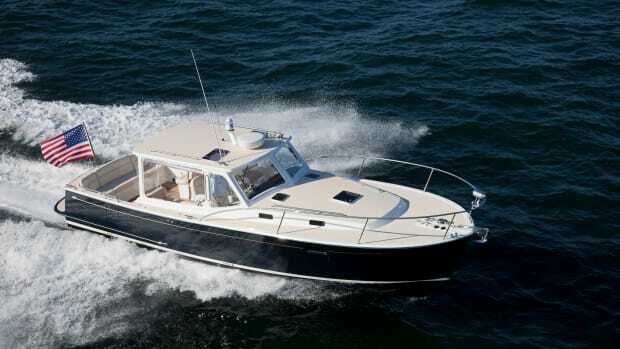 The pilothouse should please the most demanding skipper, with a centerline seat behind a burled dash boasting a Furuno NavNet package, including AIS-equipped radar, GPS, chart plotter, digital sounder, and twin 19-inch monitors. 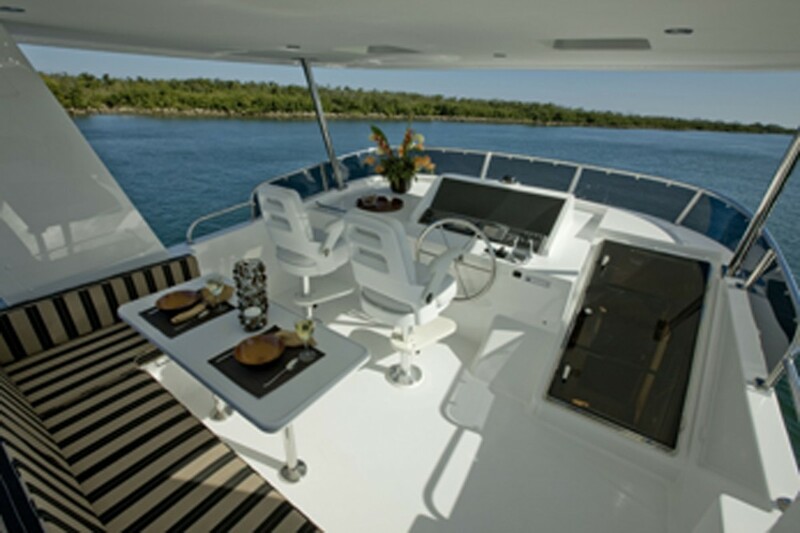 (The flybridge helm also is equipped with twin monitors.) 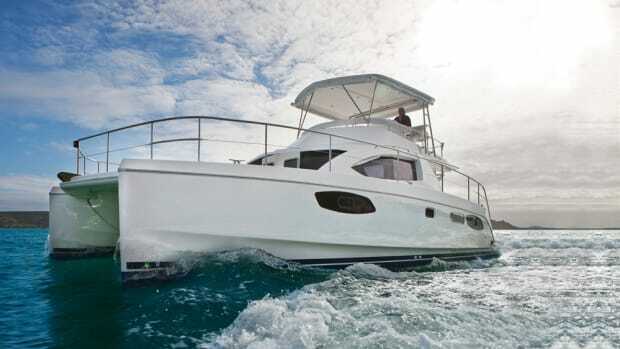 Other electronics include Axis cameras, an Icom VHF, Simrad autopilot, Nobeltec navigation system, KVH satellite HDTV, and a redundant Maretron GPS and sounder. If you don&apos;t like the standard electronics, you can opt to select your own. While it&apos;s not part of the pilothouse electronics, I was impressed to see a Maretron repeater next to the berth in the master stateroom: the skipper only has to turn his head to check all the essential data in the middle of the night. Diamond/Sea-Glaze doors lead to the side decks, and the usual table and settee are aft of the helm seat. I was surprised that the large chart area outboard of the helm was covered by padded vinyl. A set of dividers will make short work of that stylish but impractical fabric. Ocean Alexander did a nice job of placing the Furuno chart plotter and autopilot controls close to the skipper&apos;s right hand, allowing full control without having to lean forward to the dash. Various monitors such as TankWatch, Tank Tender, and inverter controls are recessed in the same console. A large breaker panel in the stairway to the lower deck is well marked for the 12/24VDC and 120/240VAC systems, inverters, and pumps, but because its pair of Lucite doors opens only halfway, it is hard to access. Bending over the doors to find a breaker would become annoying in short order. Down those stairs are the master stateroom and a forward VIP cabin, both with queen-size berths. The master is a pleasant retreat notable for its oversized hanging locker, as well as its spacious head with large shower. Our test yacht had the crew cabin just aft of the master suite, with access via stairs from the saloon. It&apos;s a tidy area with two bunks, a head with shower, and a stacked washer-dryer. A watertight door leads directly into the engine room, which, with only a single Cat diesel, is...well...immense. There is obviously superb access to all sides of the main engine, as well as to the 20kW Northern Lights generator mounted to starboard, an upgrade from the standard 15.5kW genset. The upgrade makes an emergency get-home drive system possible, using a power take-off from the generator to a clutched hydraulic motor between the main engine and the prop shaft. Taking up some of the space opposite the genset was the Seakeeper 7000 Gyro, which is less expensive and more efficient than similar gyros. An interesting point is that the gyro acts as a zero-speed stabilizer, keeping the 60 Trawler rock steady at anchor, as well as under way. Twin fuel tanks of 5052 aluminum plate are mounted outboard. I liked the full-height sight gauges on each tank, not just because they were well protected in polished stainless steel brackets, but because they were carefully calibrated in 50-gallon increments. An immense Delta "T" ventilation system is standard, as is the Gulf Coast Filters fuel polishing system, like the ones used on M1 Abrams main battle tanks. The four Cruisair compressors are rack mounted for easy service, and dual Racor filters for both the main engine and the generator are plumbed to allow the filter to be cleaned without shutting down the engines. 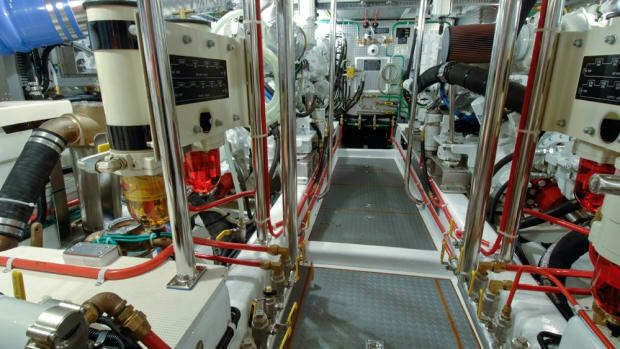 I was impressed with the finish of the engine room, from the smooth fiberglass overhead to the Heronrib rubber flooring, and all the wiring and plumbing was secured to meet or exceed ABYC standards. Farther aft, a watertight door leads to the huge lazarette, with ready access to all steering components, as well as the rudder posts. If the crew cabin isn&apos;t chosen, this space will hold spares and provisions for a very long cruise. All the stairs on the OA 60 Trawler are gentle, with risers to suit creaky knees, and the ones from the pilothouse to the flybridge are no exception. I&apos;d like the security of an inboard railing, though. Up top, a beautifully finished fiberglass hard top covers the bridge, and the forward helm duplicates the electronics at the lower station. There is the usual settee with table behind the twin helm chairs, and a console just behind the bridge has a Miele grill, a teensy sink, and a fridge. The boat deck is simply vast, with enough space to carry a 14-foot tender, limited only by the Steelhead 1500 crane. And there would still be room for a fleet of kayaks and assorted water toys. Under way, the Ocean Alexander 60 Trawler was delightful. Steering was light but positive, and the throttle response was immediate. This yacht has a fair amount of windage, which is only a concern when docking, but the Keypower bow and stern thrusters make single-engine handling easy. Top speed with the single engine is about 13 knots, with a comfortable cruise of 8/10 knots that should provide a good range and long engine life. I came away liking the 60 Trawler a lot. She&apos;s beautifully built to very high standards, thoughtfully equipped, and very comfortable. The only dilemma I can see for buyers is deciding which layouts and which engines they want. But, in the end, all the choices are good ones. I also tested the OA 60 Trawler in the two-cabin configuration with a pair of 455hp Cat C7s, and I discovered that I liked both boats a lot...mostly. I found features on each boat that I preferred, but the good news is that Ocean Alexander would allow me those choices. Each buyer is going to have his or her own preferences, but let me share mine. I liked the single-engine version because my interest is in long-range cruising, not harbor hopping. But it was interesting that the top speed of the twin-engine boat is only a knot or so faster, although I expect the twin would have a higher cruise. Still, I&apos;d trade a couple of knots for a lot of range any day. The two-cabin boat I tested had a"bonus room"aft of the master stateroom, rather than the crew cabin (below)-a dressing area and laundry with large cedar-lined lockers, a stacked Maytag washer-dryer, and even a sink and fridge. If you don&apos;t need the crew cabin, I&apos;d sure pick this version. It turns the master stateroom into a spacious retreat. A second benefit is a compartment between the dressing room and the engine room that was fitted with a stainless-steeltopped workbench any skipper would love. With twin engines, the engine room was more crowded, of course, and access to the generator was problematic. Ocean Alexander did a good job of moving filters and systems to make them serviceable. Another change on the two-cabin boat is in the galley.The aft bulkhead, instead of being solid, incorporates an opening into the saloon. This wasn&apos;t intended as a pass-through as much as a talk-through, allowing the cook to be part of the saloon conversation. It opens up the galley pleasantly. The jury&apos;s out on the gyro-versus-stabilizers debate, because we didn&apos;t have any seas to try either system on this trip. The gyro costs a big chunk of change, but that zero-speed stabilization could be priceless in a rolling anchorage.Tough call. Two delightful yachts, sisters under their skin, but clearly aimed at different owners.Which are you? HOLDING TANK 60 U.S. gal.